Designed to simplify the monitoring and management of both today’s and tomorrow’s emerging payments technologies, SWITCHWARE® is the revolutionary fourth generation of CSF International’s ATM Driving and Debit Payment Authorization and Transaction Switching System Management software. Incorporating the transaction processing power, scalability and functionalities of SWITCHWARE® with G4 Web-based Apps, SWITCHWARE G4 is CSFi’s most advanced electronic payments and transaction switching software solution. In an environment where the ability to accommodate the latest innovations in profit maximizing technology is more important than ever, the flexibility and scalability of SWITCHWARE is unsurpassed. Able to interface with virtually any EFT connection or “open standards” third party application, the solution allows for easy integration with “best of breed” legacy or future additions to an electronic payments operating environment. The solution introduces a host of new features proven to streamline operations and minimize costs while maximizing data and transaction security. Recognized as the most cost effective, scalable and feature rich solution available, leading financial institutions around the world now rely upon SWITCHWARE to meet their ATM and payment card delivery channel requirements. 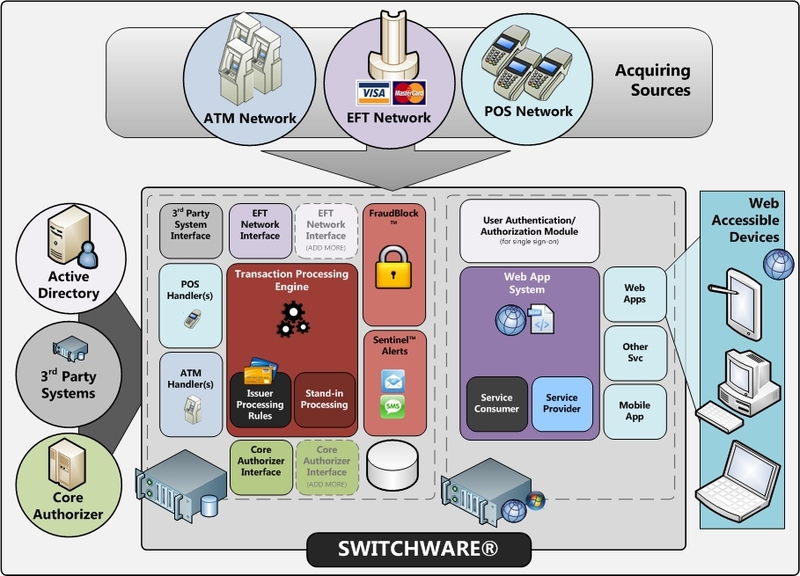 Compliant with PCI DSS and PA-DSS 3.2 validated, SWITCHWARE provides ATM driving and managing, POS acquiring and merchant managing functionality while simultaneously streamlining every aspect of payments network management. While the primary purpose of the system is to perform payment authorization and routing decisions, SWITCHWARE G4 provides a complete “single system” management solution. Release 4.0 represents a major milestone for SWITCHWARE as it incorporates dynamic process management; greater cardholder security measures in complying with the latest PCI-DSS and PA-DSS standards version 3.2 plus added functions including card alerts, enhanced limits, linked-account limits, and much more. Highly intuitive navigational tools provide easy access to an expanding suite of G4 applications including an “at-a-glance” system-wide status monitor providing a real-time, command level view into the performance and availability of every ATM, system, transaction processing, cardholder maintenance, and fraud management functionality. Supporting the latest single sign-on browser-based technology, the G4 web client eliminates the need for version control of client software installed on each PC and provides an entirely fresh look-and-feel for users performing system monitoring, management and transaction and cardholder research tasks. Core to G4’s powerful suite of web-based applications is the system-wide status monitor page. The system-wide status monitor page provides graphical real-time visibility into the entire operating environment and serves as a gateway to the advanced features and functionalities of SWITCHWARE® G4. Providing for the efficient monitoring and management of the entire switching network including real-time details of ATM device functionality, the hover-over and drill down facilities of the G4 interface make it easy for any user to access and utilize the solutions full capabilities. The monitor’s vibrant icon based display and color coded alerts allow for immediate determination of the status of ATM networks and individual ATM terminals, network connections, processes, and database storage status, and provides single click access to the systems powerful card, system maintenance, and research and reporting tools. On-demand Network Denial Rules New! NCR Aptra Interactive Teller Read more… New! CSFi provides project coordination, system setup, training, and remote live conversion assistance. In addition to the system parametrization and setup, CSFi also assists customers with certifying the ATM/EFT network, including transaction processing and sending the card maintenance batch file.